Download your online media kit! Below are materials we hope you will find helpful when reaching out to the local media. Some of the documents we have provided are Word documents so that you can customize them to fit your event. If you have any questions regarding a media strategy and getting coverage for your event, please do not hesitate to contact Will Nolan at Will@ParentProjectMD.org. 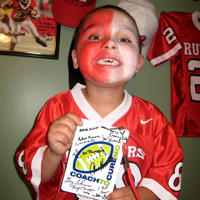 Check out our Media page for press that Coach to Cure MD has received.